Ben Raine continued to make his mark in this season’s Vitality Blast competition with a stunning innings to help Leicestershire Foxes take the bragging rights in the East Midlands derby, with a 17-run victory over Notts Outlaws at Trent Bridge. Raine scored 83 as the Foxes totalled 193 for six, scoring his runs from only 43 balls, with six fours and five sixes. In three away matches in this season’s competition the 26-year old has now plundered 219 runs from only 96 balls. Jake Ball was the pick of the home attack, with three wickets for 40. 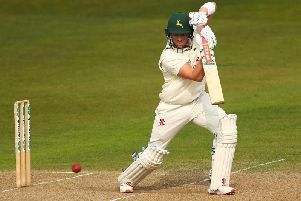 Notts appeared to be romping towards victory in the early stages of their reply, as Riki Wessels rattled his way to a 22-ball half century, a landmark reached with back-to-back sixes off Zak Chappell. Wessels scored 58 but then fell to man-of-the-match Raine, who also held a steepling catch to remove Samit Patel. The defending champions could only muster 176 for nine, with Mohammad Abbas taking career best figures of three for 32. At the start of the evening the Foxes, invited to bat first, lost both openers inside the powerplay overs; Neil Dexter checked a drive off Harry Gurney to cover for 30 and Cameron Delport, who scored a century in this fixture last season, chopped on for 21. Mark Cosgrove, who earlier in the day extended his Leicestershire contract until the end of the 2020 campaign, was bowled in Steven Mullaney’s first over, leaving the visitors on 89 for three at the halfway stage. Raine, a week after registering his maiden century in the format, launched an assault on the Outlaws’ attack from the moment he arrived in the middle. He sped to his 50 from only 28 balls, reaching the milestone with a huge pulled six off Dan Christian, his fourth. The left-hander added 57 in just six overs with Colin Ackermann, the Foxes’ skipper, who made 29 before falling to Ish Sodhi. In the penultimate over Ball secured his third wicket when he bowled Raine to bring an excellent innings to an end. Notts recovered from the early loss of Will Fraine thanks to Wessels, who scored 50 of the first 54 runs. Tom Moores made 23 from only 12 deliveries, alongside him, but both players fell within the space of nine deliveries to leave Notts only narrowly ahead after nine overs. Abbas swung the contest decisively towards the former three-time winners, with the wickets of Christian and Ball in the 13th over and the Foxes could relax completely once the same bowler removed Billy Root for 23. Fittingly, the last blow belonged to Raine, who finished with two for 47 after bowling Sodhi in the final over. The outcome leaves both sides with identical records of three wins and three losses in the ultra-competitive North Group, with neither having yet won a home match. Despite the disappointing on-field result, the attendance of 13,657 was Trent Bridge’s consecutive third gate over 10,000 this season.